The food was sooooo good I forget to take pictures. And it was beautiful. Thai food always has a visual aesthetic, but even our mixed up salads were gorgeous — imagine little squid tentacles bathed in lime juice and chili with lots of cilantro. 17 people on Yelp agree with me, granting On’s a 4 star average rating. It’s the best Thai food I’ve had outside of Thailand. I have to go back soon. I have to try everything on the menu. It’s my new favorite place even if I have to wiggle my way through Light Rail Construction. Order your food “mild.” We’re Minnesotans, we may think we like spicy food, but unless you’ve eaten in Thailand, don’t risk burning your lips. On’s is on the North side of University between Fry Street (on the West) and Snelling Avenue (on the East). It’s a couple of doors down from AxMan Surplus, so you can go to two cool places on one trip. If you are coming from the South, for now, the easiest way to get there is via Fry Street. Take Snelling Avenue North and turn left (West) as if you were going to take 94 West. 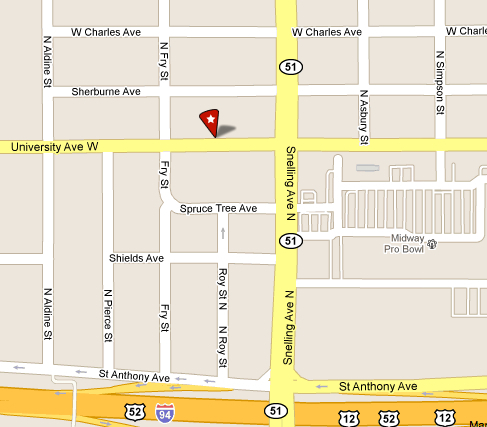 Instead get on the frontage road (aka St. Anthony Avenue) and take a quick right onto Fry Street. When the North side of University Avenue is torn up, the only way to get to On’s will be via the alley. Keep that in mind and don’t let it scare you off. I want these funky places to benefit from Light Rail and not turn into suburban style strip malls full of national retailers and boring food. Take the Step. Make the Commitment. Give yourself some extra time. Head to University Avenue.